Open Monday to Friday from 9 AM to 4 PM. All are welcome to visit us! The St. Cloud Chamber building was built in 1910 as the First National Bank of St. Cloud. It stands as the oldest commercial building in St. Cloud. 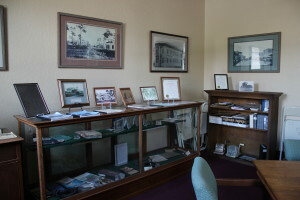 The Chamber building in its history has served as a general mercantile store, a Spanish-American War Veterans Club, a senior dance club before being purchased by the Chamber in early 1990’s and completely restored. The St. 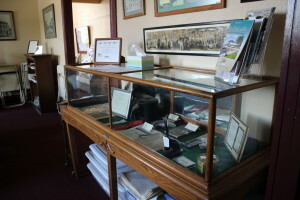 Cloud Historical Museum occupies a first floor room and houses photos of St. Cloud people and events over the years, newspaper clippings, memorabilia, high school year books, and several books that trace the ownership and original construction of many downtown residences. A number of the early homes reflected the craftsman style of architecture, popular in the 20’s. The history of the area is grounded in ranching and cattle which still makes an important economic contribution to the area. St. Cloud is known as the Soldier City, honoring the early settlers of 1909 and 1910. The majority of them were Civil War veterans, then in their 60’s and 70’s who moved to Florida to escape the northern winters. St. Cloud became known for its frequent parades which were often funeral marches through the center of town.